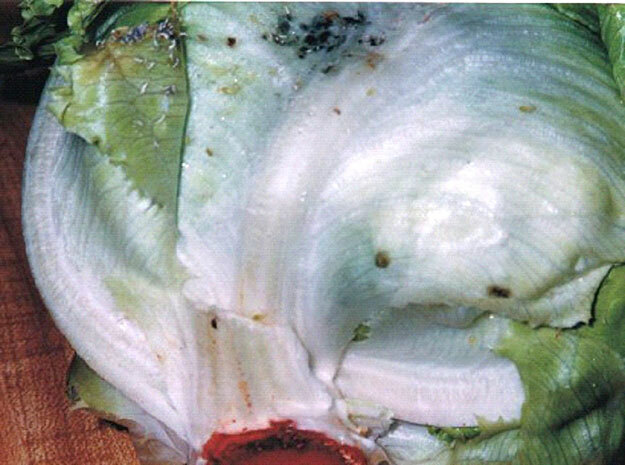 I know the USDA has been busy working on important issues within the fresh produce industry, like U.S. Grade Standards for Cultivated Ginseng, but I wish they would concentrate their efforts on improving the scoring guidelines for scoring insect and worm damage on lettuce. Score as serious damage any head when 1 live or dead worm is found in the compact portion of the head. Score as serious damage any head when more than 1 live or dead worm is found on the wrapper leaves. Score as serious damage any head when more than 5 live or dead insects are found in the compact portion of the head. Score as serious damage any head when more than 15 live or dead insects are found on the wrapper leaves. Score as damage any head that has been eaten, or excreta has been deposited in noticeable amounts on head or wrapper leaves. Score as serious damage any head that has been eaten, or excreta has been deposited in noticeable amounts on more than two head leaves. You can see the confusion, especially when inspectors are instructed to count the number of insects (aphids) on the lettuce. As I stated earlier, these are USDA scoring guidelines, found in their inspection instructions. The U.S. Grade Standards do not include these convoluted scoring guidelines. The U.S. Standards simply say to score as serious damage when the compact portion is infested with insects or worms or when the wrapper leaves are badly infested. Keeping it simple would be an improvement. Cultivated ginseng is important to all. I don’t know about you, but I don’t want to bring home any misshapen ginseng.